Bjorn Lomborg discusses the results from our set of papers focused on conflict and violence. Major news sources around the world have begun to carry a Reuters article reporting on our recent research in regards to the benefits and costs of conflict and violence targets for the post-2015 development agenda. CNN Live interviews Anke Hoeffler co-writer of our conflict and violence assessment paper. Violence at home costs $8 trillion a year. Reuters reports on the findings from our research papers focused on conflict and violence in the post-2015 development agenda. The Guardian has published an article reporting on the findings from Anke Hoeffler and James Fearon’s research paper on conflict and violence targets, highlighting the findings related to domestic abuse. Scroll down for short summary. Or download the one-page PDF containing the smartest targets to redress Conflict and Violence. There is an ongoing debate on what has brought about the reduction in violence over the past three decades in high income countries, but the phenomenon cannot be reduced to the application of a few societal programs. Attitudes to violence typically change slowly over time; examples are wife beating and corporate punishment of children. Programs aimed at reducing violence are thus unlikely to produce results quickly. In addition, many programs have not been set up in a manner allowing rigorous evaluation. For many of these interventions we neither know their impact nor do we know their costs, thus making it impossible to provide BCRs. Despite the uncertainty of what feasible targets for violence reduction are and how they can be achieved, we advocate the inclusion of such targets in the post-2015 agenda. Our estimates suggest that the costs of violence are high; the welfare cost of collective, interpersonal violence, harsh child discipline, intimate partner violence and sexual abuse are equivalent to around 11 per cent of global GDP. The cost of homicides are much larger than the cost of civil conflict. However, violence perpetrated in the home appears to be the most prevalent form of violence. Domestic abuse of women and children should no longer be regarded as a private matter but a public health concern. Scroll down to read our series of reports examining conflict and violence targets for the post-2015 development agenda, written by leading economists and experts. Anke Hoeffler, Research Officer at Oxford, and James Fearon, Professor of Political Science at Stanford University, break new ground in estimating the global costs of violence and conflict in an Assessment Paper for the Post-2015 Consensus. The paper shows that the costs of collective, interpersonal violence, harsh child discipline, intimate partner violence and sexual abuse represent 11% of worldwide GDP. Interestingly, the types of violence that are most costly to society are ones that tend to attract less attention, in both development spending and public imagination. 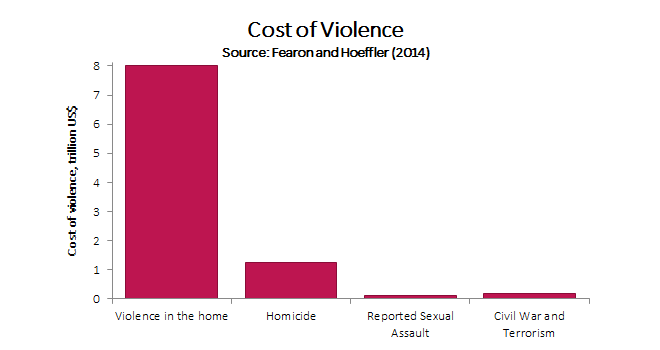 Violence in the home is 6.5 times more costly than homicide, and 50 times more costly than civil war. The paper does not offer definitive benefit-cost ratios for targets, pointing to scant evidence with which to base assessments. Nevertheless, the authors strongly recommend that targets to address violence should be included in the final post-2015 list. We argue for moving beyond a near-exclusive focus on civil war violence … to recognizing that the costs of interpersonal violence are probably much larger but are almost wholly neglected in current development programming." S. Brock Blomberg, Professor of Economics and Finance at Claremont McKenna College, commends the effort of the assessment paper authors in cataloguing various forms of violence, their costs and the benefits of existing programs. However, he argues that the inability to derive benefit-cost assessments is a notable weakness of their analysis and attempts to fill this gap. He suggests targets to curb violence on a global basis are likely to have small benefits for every dollar spent. Rodrigo R. Soares, Professor of Economics at the Sao Paulo School of Economics, sympathizes with the challenges the assessment paper authors have in providing benefit-cost ratios for targets. Extrapolating studies outside of the original context is risky. Instead, the discussion would benefit from a slightly different perspective, taking a further step back to define specific issues of paramount importance together with promising interventions. Under these criteria, the focus should be on common crime, rather than civil conflict or violence against women and children. The viewpoint of Abigail E. Ruane, Peace Women Program Manager at Women’s International League for Peace and Freedom, finds that the assessment paper provides a revealing evaluation of the costs of violence and the need for a violence prevention approach to development. However, Ruane states that the arguments in the paper are based on very conservative economic benefit-cost assessment of general trends. Instead, in Ruane’s view, a more promising means of reducing violence would be to take a holistic approach to strengthening the participation, protection, and rights of women and other at-risk groups across the conflict spectrum to prevent the root causes of violence and conflict. As the next development agenda is designed, policymakers should take to heart Fearon and Hoeffler’s call for a violence-prevention approach to development that addresses all forms of violence, not just violence in conflict." The viewpoint of Ciara Aucoin, former Program Associate at Conflict Prevention and Peace Forum, Social Science Research Council and Olivia Russell, Editorial Coordinator at Stability: International Journal of Security and Development, finds that the overall approach of the paper provides a rational way to analyze the global toll of violence in middle and low income countries. In this viewpoint paper, Aucoin and Russell explore some of the limitations of data employed within the assessment paper and identify a number of ways that the core argument of the paper—that societal violence requires a set of standalone targets in the post-2015 agenda—could have been made into a more compelling case. The authors paint a robust picture of the scale for both interpersonal violence and collective violence. They make a strong case for why the international community should widen their focus beyond civil war to include targets for reduced homicide, domestic violence, and other forms of societal violence in the post-2015 development agenda." Overall, the viewpoint of Charles Ransford, Director of Science and Policy at Cure Violence, agrees with the authors - that violence reduction is crucial to economic and social development. However, Ransford’s view is that the analysis provided in the paper is imperfect and likely underestimates the problem, but even this underestimate shows that violence is a huge cost to society and warrants prioritization. According to Ransford, violence greatly impedes the world’s ability to address almost all the issues that have traditionally been identified as underlying causes of violence. If we focus more resources on interrupting and stopping the spread of violence, not only will we have less violence, but we will significantly increase the potential of success for interventions that address the underlying causes of violence. "We see a great opportunity to take on violence and make a big impact that will not only affect violence but will have a ripple effect in many other areas."